THAT interest in astronomy is growing in Canada is very evident. One need only point to the magnificent new observatory erected by the Dominion government on the outskirts of Ottawa, and to the fact that a fully-equipped expedition was despatched to the wilds of Labrador to observe the total eclipse of the sun on August 30th last. The Royal Astronomical Society of Canada had the honor of suggesting that an expedition be sent, and the generous spirit in which the proposal was received and acted upon is worthy of all praise. The society was allowed the privilege of naming six of its members to accompany the expedition. The first section of the expedition sailed from Quebec on the evening of Friday, August 4th, in the steel steamer King Edward, a small vessel about 150 feet long and 22 feet wide. This ship and her mate, the Aronmore, about twice as large, carry on a coasting trade on the north shore of the River and Gulf of St. Lawrence. The manner of conducting this trade was new to most of us. The shore usually is of bleak, bare rock or of sand, occasionally covered with spruce and scrubby birch, and the inhabitants of the little villages along it eke out an existence by hunting and fishing. On approaching a village the ship, with her siren, would shriek out what always sounded to us like a challenge to the people to come out and meet us. Then we would drop anchor and wait. Soon a large fishing boat would put out from shore, sometimes propelled by oars, sometimes under sail. Occasionally the boat would be tardy in coming, and then a volley of forcible remarks would be hurled at it to hasten it along. But on arrival at the ship the strong words were all forgotten, and the visitors and visited communed on the best of terms. Having received their mail-bag, and what freight the purser had for them, they would leave, and we would proceed on our way. Frequently, however, a strong wind blew and the sea was rough, and we had to lie at anchor for hours. At last the boat would come, and we would watch with admiration the sailors as they tacked about, and finally ran close up to our ship to receive the barrels of flour and boxes of merchandise into their small craft, which all the while danced vigorously about on the tops of the waves. It was amusing to notice some of the parcels put off. One was a pasteboard box, apparently containing a hat, sent from a Chicago department store via Detroit: another was a Singer sewing machine, and a third was a spinning-wheel. Then, again, some poor unfortunate would try to beat his way, but the vigilant purser was on the alert for such and seldom did one escape. This performance lasted for three days, during which time we called at eighteen ports, including Godbout, Pentecost River, Seven Islands, Moisie, Mingan and Esquimaux Point; and on the morning of the fourth day we reached Natashquan, the end of the ship's regular trip. Here we discharged our last passengers and freight. Amongst the former was a young Anglican clergyman, named Vibert, who was spending his strength as a missionary on the long bleak coast: while among the latter was an immense sheet-iron tank for the priests' house. From this time on the ship was all our own. We sat on deck and read, or dozed, or told stories, or watched for whales, in all these ways becoming acquainted and finding out that we had a very congenial company. In another day we reached Blanc Sablon, a small village at the entrance to the Straits of Belle Isle. We halted to deliver the mail—a few letters in a small bag—and to pay our respects to the Newfoundland customs officer. Immediately on entering the straits we came upon a magnificent iceberg. The day was fine, and the obliging captain steamed near enough to allow the numerous cameras on the ship to secure fine negatives. But this splendid berg was but the first of fully a thousand which we saw. They were truly majestic in their slow-moving dignity: the play of the sunlight on their towers and spires and castellated summits giving us a sight never to be forgotten. At one time two of our party counted over a hundred in sight. Emerging from the straits we passed Battle Harbor on the left, and after skirting the bleak Labrador coast we entered Hamilton Inlet. Here the course wound about the rocks and jutting points, and a last a village appeared directly ahead of us. This was the important Hudson's Bay post of Rigolet, in charge of Factor Fraser. Many of the party went ashore, but as the day was quiet and damp the black flies and mosquitoes were exceptionally annoying, and all were glad to return to the ship. We left Rigolet next morning at sunrise, and after traversing Lake Melville, about seventy miles in length, we found ourselves at the end of our long journey, at the post of North-West River (10 a.m., Friday, August 11th). Soon, in response to our siren, a small boat came out, rowed by Professor L. B. Stewart, of the School of Practical Science, who had gone ahead of us, by way of St. John's Nfld., to choose a proper place to locate our camp and our instruments. In order to see the sun entirely covered by the moon the observer must be somewhere within a belt about eighty miles wide, which runs across certain portions of the earth, calculated very accurately by astronomer: and for most efficient work it is necessary to be as near as possible to the central line of this "path of totality." Professor Stewart had determined the latitude and longitude, and found that a flat, open space within half a mile of the Hudson's Bay post and its small wharf was very close to the central line. This space had been cleared of spruce by the present Lord Strathcona when located at North-West River about fifty years ago, and had been used many times as a camping-ground by the Mountaineer Indians. 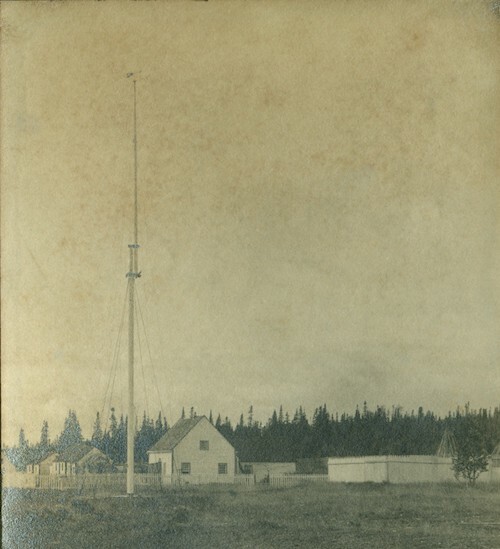 The Hudson's Bay post is shown in the adjoining picture. In the foreground is the residence of Mr. H. M. S. Cotter, the Hudson's Bay factor, who formerly attended Upper Canada College, and who was delighted to get news of his alma mater. On our arrival he was ill, but in a few days he was able to be about, and during our entire stay he was unremitting in his kind attentions. The members of the expedition cannot speak too highly of the unvarying kindness and consideration received at this hands. The other houses in the picture are the company's store and warehouses, and the dwellings of its servants. Immediately across the river is the trading-post of Revillon Frères, the great rivals of the Hudson's Bay Company. A small schooner belonging to this post was engaged to transport our freight from the King Edward to the small dock. Dressed in seaters and old clothes all hands worked heartily, and by nightfall all the goods had been removed from the ship, and much taken to the camping-site. In doing this a hand-cart, three wheelbarrows and numerous broad shoulders were utilized. That night was spent on the steamer, and next morning, after an early breakfast, all went ashore, and the King Edward left to return to Quebec. Some of the party pitched the tents, others continued the transportation of our supplies, while others began the construction of huts and piers for our instruments. We had brought a good supply of lumber, and ten barrels of Portland cement, and, indeed, sand, too: but as there was plenty sand at our disposal we left what we had brought in the ship for ballast. A view of the camp is shown in the picture, looking northwest. To the extreme left [right in the reproduction here] is the hut, built with copper nails and covered with tar-paper, which sheltered the magnetic-recording instruments. The shanty at the right [left] is a photographic darkroom. The black one in the centre was Professor Stewart's observatory, while the two to the left of it belonged to the English party, being used to cover telescopes and for a photographic room. In the background is the old mission church, erected in 1873, but discarded about ten years ago. From it the floor, windows and sheeting had been removed. The bell tents were used for sleeping, the large marquee near the church was a dining-tent, and the others sheltered the instruments and tools. To the north of the camp were the spruce woods. As the time available for observations of a total eclipse is always very short—in this case but two and a half minutes—the apparatus was largely photographic. One can make numerous exposures during the short time, and examine the negatives at leisure. There were numerous showers, and the black flies and mosquitoes were very troublesome, but we had not time to spare, and everyone worked with a will. At the end of ten days the installation was practically complete, leaving about a week to perfect adjustments and rehearse our programmes. The most important part of the equipment was that from the Dominion Observatory. It consisted of four cameras of focal lengths, 7, 10, 10 and 45 feet, respectively, and three spectrographs (i.e., instruments for taking photographs of spectra). As it is impracticable to point a 45-foot camera at the sun the sunlight was reflected into it and the other cameras by means of an instrument known as a coelostat. This consists of a mirror rotated about an axis in its plane, and parallel to the earth's axis, and turning exactly half as fast as the earth moves. In this way the light from the heavenly body is continuously directed wherever it is required. The mirror used in this case was of glass, twenty inches in diameter, three inches thick, silvered on its front face, which was absolutely flat. The entire instrument weighed about 2,500 pounds, and was transported in about fifteen boxes. A general view of the installation is shown in the engraving. The coelostat is at the left [right], with the wooden cameras on two cement piers before it. The long extension is the 45-foot camera, the plate-holder being at the right-hand end. To operate these cameras six men were required. 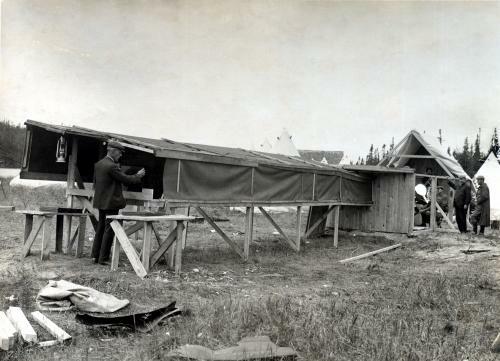 The apparatus was in a shed with a tarpaulin roof, and with sides and eastern gable removable. The picture shows the whole ready for use. The darkroom is seen just in the rear. The entire equipment was designed and installed in a masterly manner by Mr. John S. Plaskett, B.A., of the Dominion Observatory. In his work he was very efficiently assisted by Mr. W. P. Near, B.A. The telescope on a tripod, at the right, is a four-inch instrument, belonging to the Royal Astronomical Society, and with it Dr. King, the commander of the expedition, intended to observer the four contacts, i.e., the times at which the circumferences of the sun and moon touch. The other telescope, on the cement pier, belongs to Rev. Father Kavanagh, S.J., the amiable professor of mathematics and science in Loyola College, Montreal. He proposed to sketch the outer coronal streamers, the brighter inner portion being screened from the eye by an ingenious arrangement. THE OUTFIT OF THE ENGLISH PARTY. In another photograph is shown the outfit of the English party, in charge of Mr. E. W. Maunder, of the Royal Observatory, Greenwich, who stands beside the photographic telescope at the left. At the extreme right is Mrs. Maunder, with here small equatorial, by means of which she obtained some exceptional negatives at the Indian eclipse, 1898. Mr. and Mrs. Maunder are experienced eclipse observers, and were invited to accompany the Canadian expedition by Sir Wilfred Laurier. 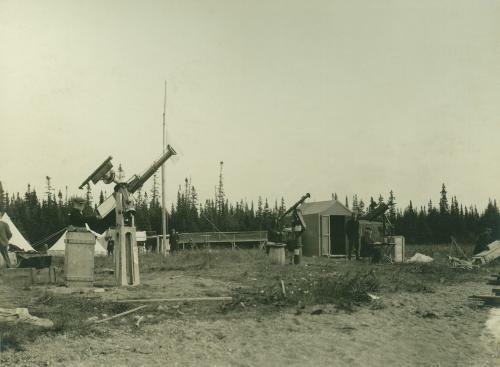 There are two other photographic telescopes in the picture: that to the left being operated by Mr. Charles Upton; that to the right by Mr. F. P. Jennings, both of England. Mr. J. A. Russell, of Windsor, N.S., sits at the table. From the Royal Observatory a party had also been despatched to Egypt, with instruments identical with some of these, and it was hoped that photographs might be obtained at both ends of the eclipse track. The work in Egypt was entirely successful. To Mr. Wm. Menzies, of the Magnetic Observatory at Agincourt, was assigned, by the Director of the Meteorological Service, the task of determining the magnetic elements, both by recording instruments and eye observations. By working night and day Mr. Menzies managed to build his hut and get his instruments in operation in a very short space of time. The results obtained are of great value. In this work able assistance was given by Professor A. T. De Lury and by Mr. Louis Gauthier, of the Dominion Observatory. Professor De Lury also assisted our Chief in some computations; and had intended, during the eclipse, to make visual sketches of the corona, and also to note any variation in the electrical condition of the atmosphere. Rev. Dr. Marsh and Mr. G. P. Jenkins, of Hamilton, had a five-inch clock-driven telescope, a grating camera and two smaller telescopes. They intended to take numerous photographs of both the partial and the total phase. Mr. J. R. Collins, of Toronto, by using a telescope of his own invention and construction, intended to take a rapid series of photographs during the entire time of the eclipse, with the hope of exhibiting the phenomenon in cinematographic fashion. Mr. A. S. Johnston (B.A., '85 Tor. ), editor of the Technical World, Chicago, spread out a white sheet on which he hoped to photograph the peculiar phenomenon known as the "shadow bands." Professor L. B. Stewart determined accurately the latitude (53° 31' 31.25" N.) and the longitude (60° 7' W.) of our camp, surveyed the land in the neighborhood, and in addition measured the value of gravity. His results are of permanent value. The present writer had undertaken polariscopic observations. With a polarimeter visual observations were to be made of the nature and the degree of polarisation of the coronal light; while with a polariscopic camera, the exposures with which Rev. Father Lajeunesse, of Ottawa University, had kindly undertaken, it was intended to secure a series of photographs, which we hoped would assist in settling many disputed questions. By the time the installation had been made we realized that he chances for good weather for the eclipse were not very great. But fears for the results did not deter us from perfecting every arrangement. Indeed, some of the party continued their work well into the night. Most of the members, however, as the darkness came on and the temperature fell, would gather about a bonfire, and the amount of talent exhibited in song, story and recitation was quite astonishing. There was present a genuine spirit of good fellowship, and each freely did his best to amuse the rest of the company. At one time, after two days of continuous cold rain, a fire was built within the old church; and though the smoke was dense enough to bring tears to the eyes, the genial warmth made us entirely happy. The fire was kept blazing far into the night, and sitting about on boxes and stools, or lying on an old dismantled birch canoe, the song and joke came forth with peculiar spontaneity. This was the best bon-fire of the trip; to me a pleasure I shall never forget. Monday, August 28th, was an incomparable day. The sky was blue from early morning, and we all hoped we could have the eclipse on then! That afternoon the King Edward arrived with the second portion of the expedition. These were to assist at the time of the eclispe, and the steamer was to wait and take us all home together. But at night the barometer fell, and next day was continuously wet. Still our rehearsals continued, hoping for a bright morrow, which did not come! We rose at six o'clock, and soon after went out to await the eclipse. The total phase was predicted for 7.52. Anxiously we looked to the east, but the gray clouds remained. As the time approached the darkness increased, and during totality it was so great that one could not read his watch easily. this lasted for about two and one-half minutes, and then the sky rapidly brightened, first in the west and then everywhere. It was a weird and impressive sight; but the total phase had passed, and we had made no observations! It was a great disappointment. About forty-five minutes later the clouds parted sufficiently for us to see the moon, still hiding a portion of the sun's disk. But this was of no scientific value, and in our disappointment we could scarcely look at it. At once the dismantling and packing up commenced, and the boxes, large and small, began to move again to the schooner dock. By nightfall much progress had been made. The next day was fine, and the tents were struck, as we proposed to sleep on the steamer that night. Indeed, everything was tkane to the dock by six o'clock, and the schooner was loaded, but by that itme the sea had risen so that she dared not go out. That night some slept in the abondoned instrument huts and the old church, and about twenty of us lay on Mr. Cotter's floors. Next morning the wind had fallen, and as soon as possible we went out to the ship, quickly transferred our goods, and after affectionate farewells and hearty cheers, started on our homeward trip. At Rigolet we found Dr. Grenfell, and most of us had the pleasure of meeting hte famous missionary, and of inspecting his ship the Strathcona. We learned that the Lick expedition, which had located on the coast, had been as unfortunate as ourselves. In addition to those whose names have been already mentioned the following were members of the expedition: Mrs. S. T. Codd, Winnipeg, and Miss Winnifred King, Ottawa; Joseph Pope, C.M.G., Under-Secretary of State, and John Macara, Dominion Observatory, Ottawa; Montague Aldous, Winnipeg; Rev. C. P. Choquette, St. Hyacinthe College, Que. ; Rev. H. Simard, Laval University, Quebec; Henry H. Lyman and alter E. Lyman, Montreal; J. E. Maybee and David J. Howell, Toronto. There is little to say about our return voyage. It was very pleasant, notwithstanding the rolling of the ship. We reached Quebec on Thursday, September 7th, at 10.30 a.m.
We were sorry that what most of us felt was the trip of a lifetime had ended. We were sorry, also to leave the ship and to break up the party. A more courteous and cautious skipper than Capt. Belanger, a more accomodating officer than Purser Bruneau, or a more obliging ship's crew we shall never see. We all felt, too, that it had been a great privilege to belong to a party under the command of the Government's unostentatious but very capable Chief Astronomer, Dr. W. F. King.